Home Camping Equipment What You Need To Consider Before Buying A Camping Tent? What You Need To Consider Before Buying A Camping Tent? 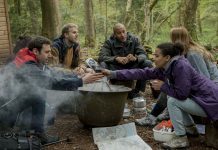 Are you planning for a camp and want to spend time in the outdoors? Then camping tent is the most important item that you need to carry with you. Here the most important thing is choosing the right type of tent and its color, quality and the size. You can find the camping tents which are really useful for sub zero temperatures whereas some others are excellent for tropical forest atmospheric conditions. 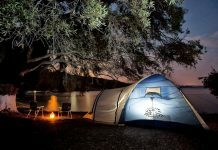 It is better to select camping tents based on the climate that you will be camping in. In order to select the right type of tent, the first thing you need to do is decide the dimensions of the camping tent that you need. Mainly tents are prepared to protect you and your family. In the market you will find the tents with labels telling their capacity, or for how many campers it is made. There is no need to choose various tents with different capacities. 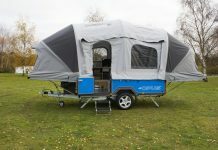 So, think carefully and decide cleverly on the biggest number of campers that you predict camping together with you. Basically every camping tent consists of four components. They include: tent body, the poles, the trap and the rain fly. The trap is basically a material that you set on the ground which helps to keep your tent floor last longer. Also consider if you have any other requirements and then decide the type of camping tent that you need. Decide your budget and how much you are going to spend on the camping tent. Once you have decided your budget you will not spend much on it. Decide on the size and weight of the tent. If you prefer car camping, the size of the tent doesn’t matter. If there are many campers to sleep in the tent it is better to pick a large camping tent. If you want to go on backpacking then it is suggested to invest in a lightweight camping tent. Search for the available aspects of the tent. It is suggested to select a durable fabric tent. Test how the tent shade spreads the light within the tent. Some colors make the interior of the camping tents brighter, whereas some colors make it dim and gloomy. 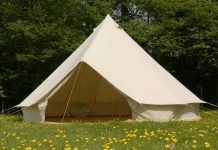 If you are planning for a summer camp, it is better to choose light color tents. For cold seasons, pick dark colored camping tents, as they absorb the heat from the sun and keep the interior of the tent warm. Also, check the coating of the tent. Look for a water proof and shiny coating inside the tent. If you don’t observe these features then the tent might not be durable enough for heavy usage. 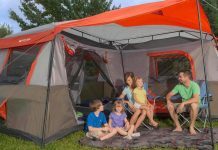 The most popular tent makers include: Great land, Coleman, Eddie Bauer, and Wenger. Select the manufacturer whom you trust most. With the wrong type of tent you can’t enjoy the camping experience to the fullest. It leaves it as an unpleasant one. So, think carefully and choose wisely while you are purchasing the camping tents. 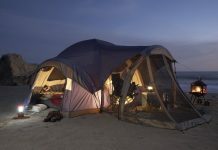 Just remember that the tent you have chosen will be the home away from your home for fewer days.